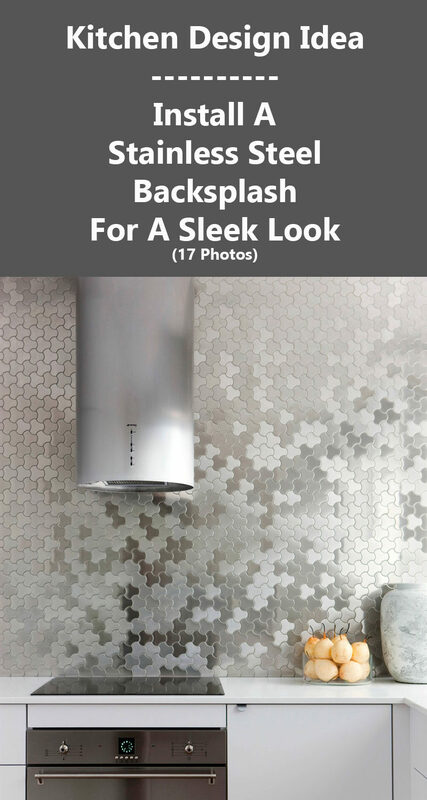 If you’ve been looking for a backsplash material that’s stylish, easy to clean, and super modern, stainless steel may be the answer. 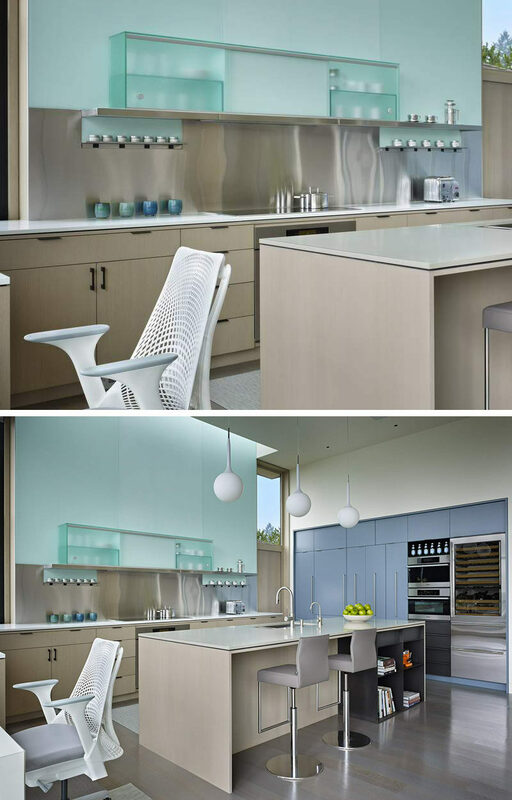 It’s a durable material that makes clean up a breeze and brightens the kitchen as it reflects the light that hits it. 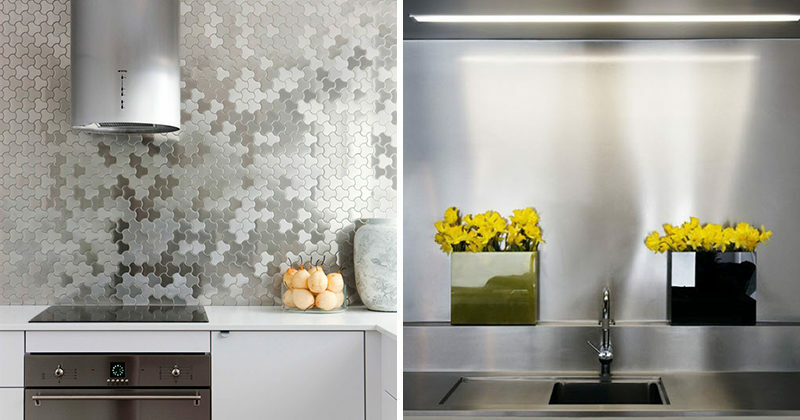 Here are 17 inspirational examples of kitchens that have stainless steel backsplashes. 1. 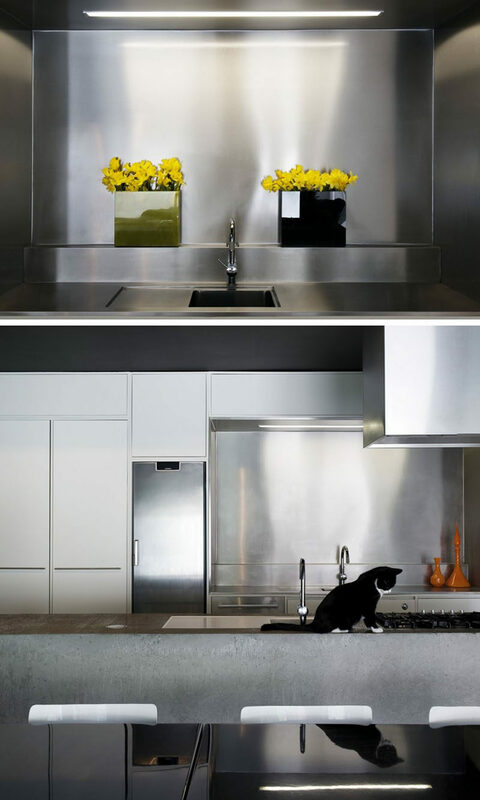 Stainless steel covers the backsplash areas of these kitchen walls to create a clean and modern look. Designed by Prentiss Balance Wickline Architects. Photography by Steve Keating. 2. 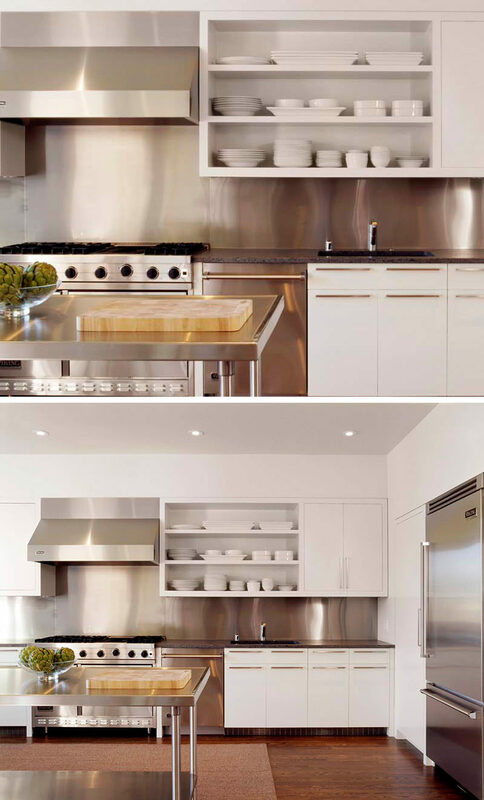 This kitchen’s stainless steel backsplash matches the appliances and island to keep the kitchen looking unified. Designed by Cary Bernstein Architect. Photography by David Duncan Livingston. 3. 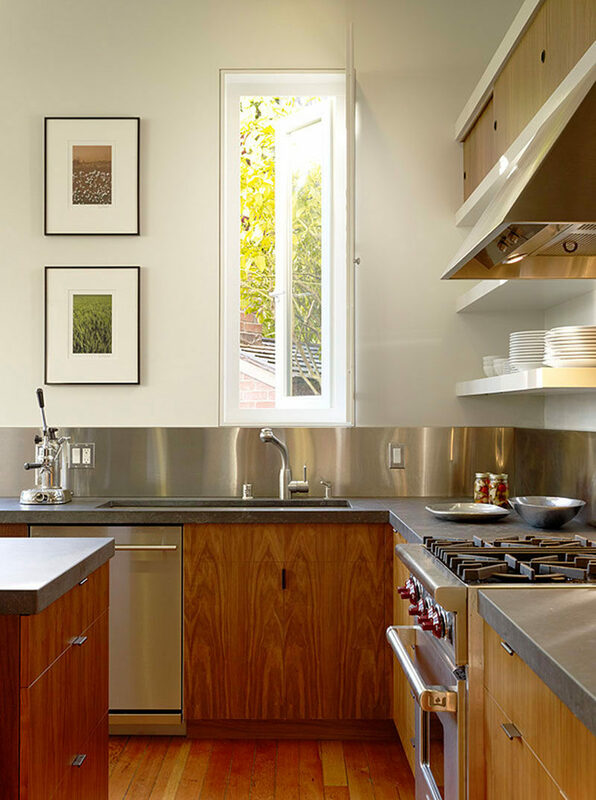 The stainless steel backsplash in this kitchen contributes to the modern look of the space. Designed by DeForest Architects. Interior design by Robin Chell. Photography by Benjamin Benschneider. 4. 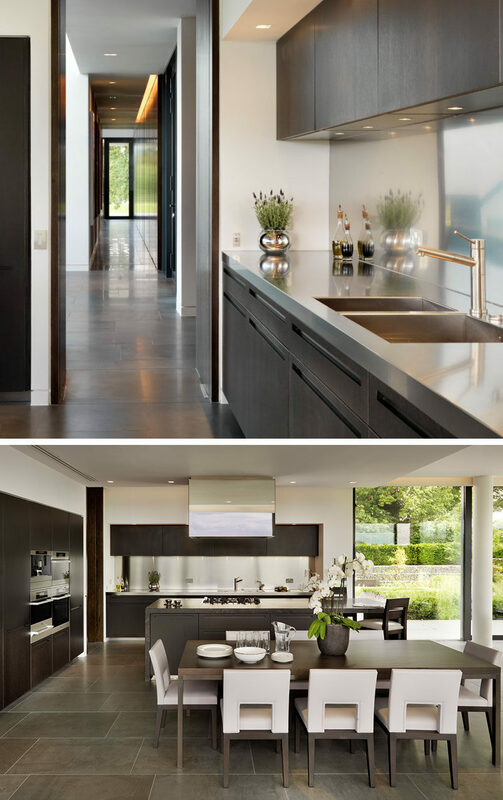 Stainless steel panels wrap around the walls of this kitchen to make for easy clean up after a messy meal. Designed by Schwartz and Architecture. Photography by Matthew Millman. 5. 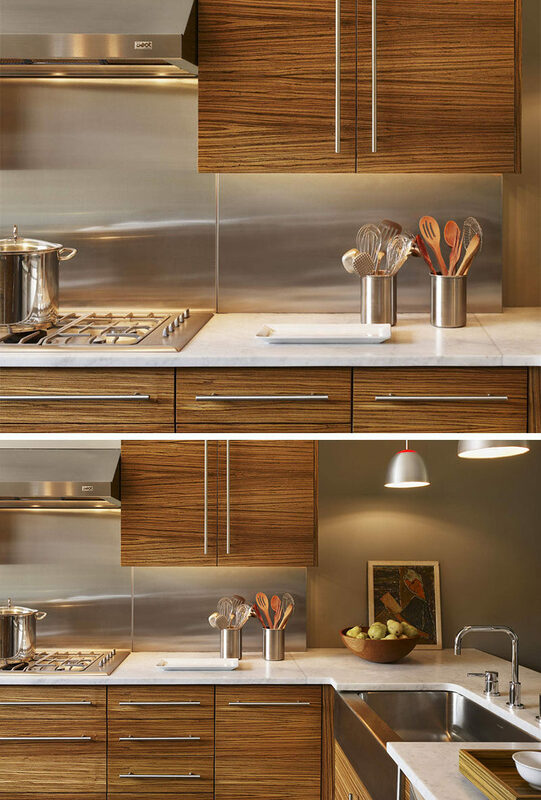 The modern stainless steel work top and backsplash contrast the natural look of the wood cabinetry and island in this kitchen. Designed by Fearns Studio. Photography by Tom Ferguson. 6. 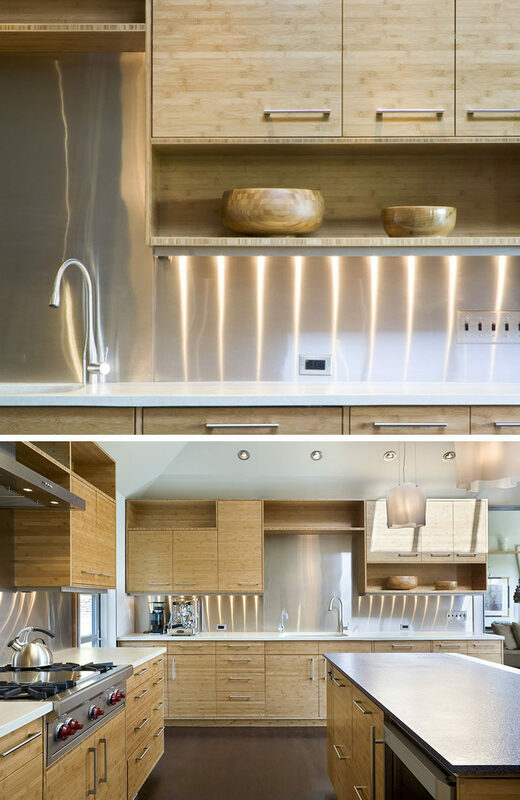 All of the stainless steel details like the sink, hardware, and utensil holders, work with the stainless steel backsplash and make this kitchen cohesive and put together. Designed by Brett Webber Architects. Photography by Halkin Photography, LLC. 7. Stainless steel tiles cover the back wall of this modern kitchen to create a unique look that’s easy to clean. 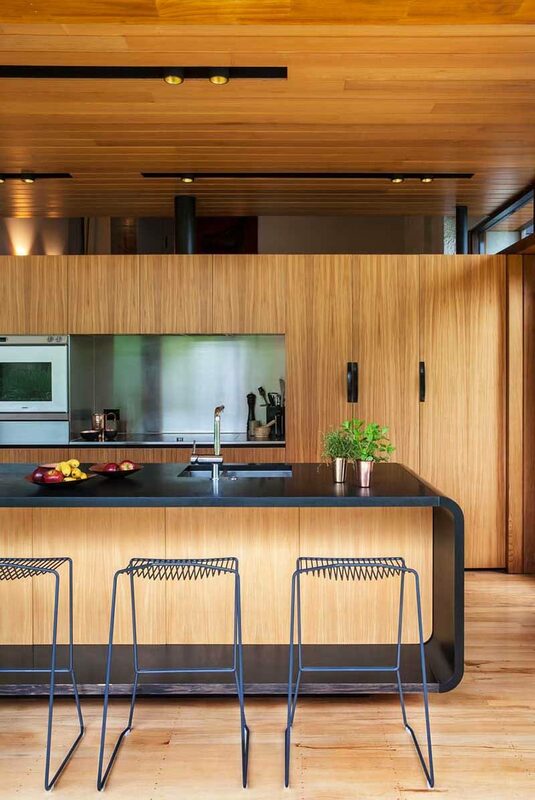 Kitchen designed by Brendan Wong Designs. Tiles by Alloy Solid Metal Tiles. Photography by Maree Homer. 8. 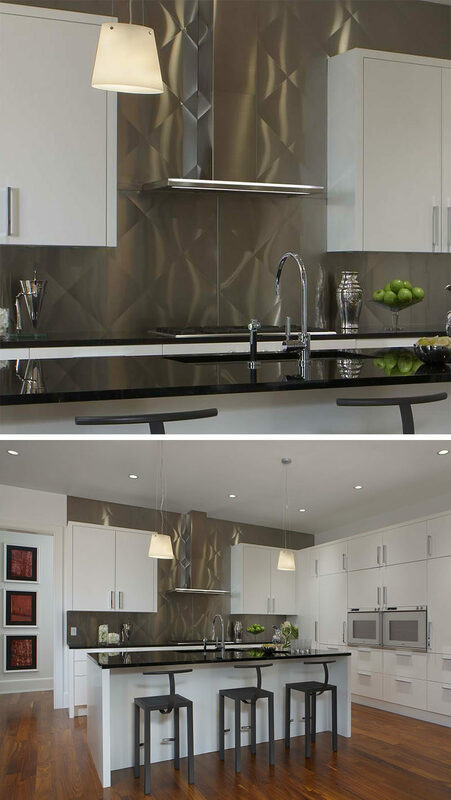 Stamped panels of stainless steel add texture to this metallic backsplash and break up the white cabinetry. Designed by EuroCraft Interiors & Custom Cabinetry. Photography by Beth Singer. 9. 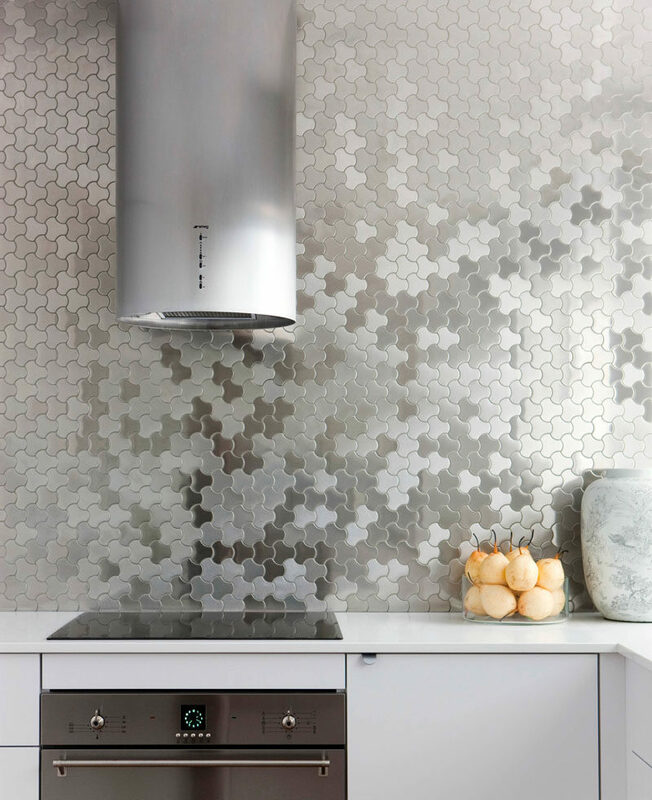 Small stainless steel tiles have been arranged in a brick-like pattern to contrast the white cabinetry and to help brighten the kitchen. Design by Contour Interior Design. Built by Capital Builders. 10. A single strip of shiny stainless steel lines the backsplash of this kitchen to match the countertops and kitchen appliances. See more photos of this house, here. Designed by Gregory Phillips Architects. Photography by Darren Chung. 11. 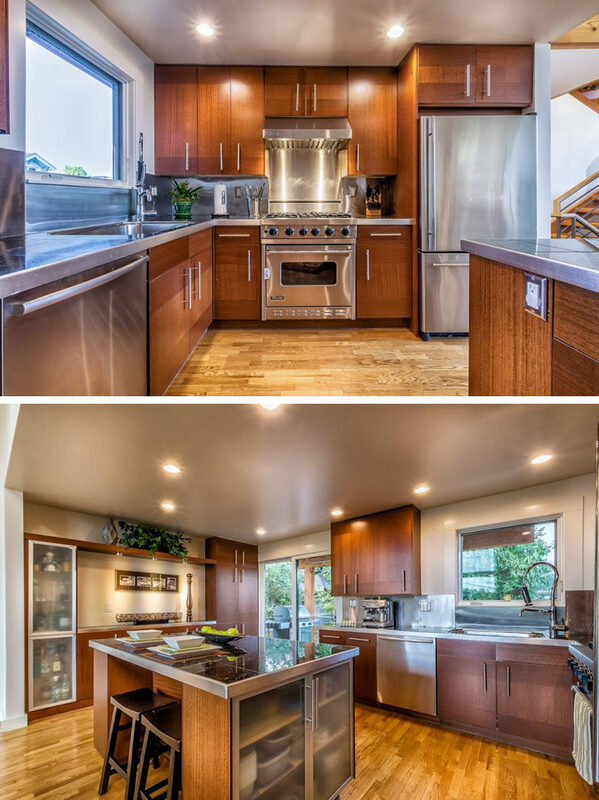 Everything in this kitchen is stainless steel, including the countertops and backsplash. See more photos of this kitchen, here. Designed by Buratti Architects. 12. 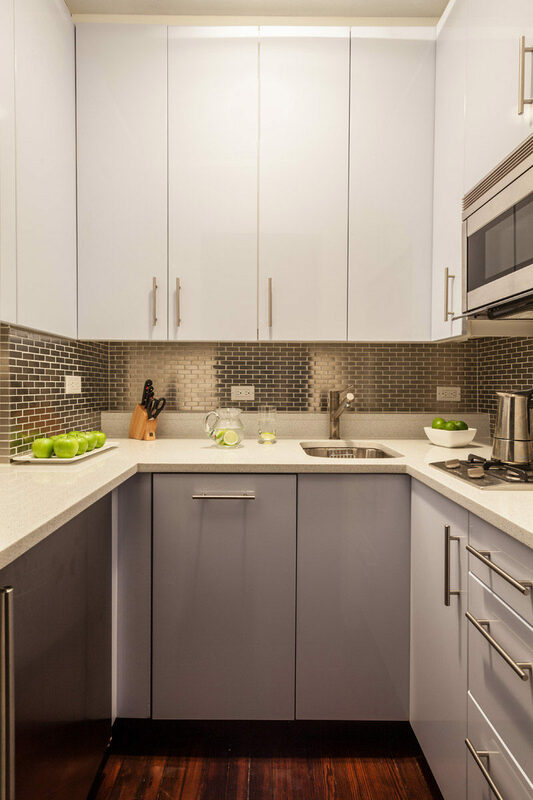 The stainless steel backsplash in this kitchen matches the stainless steel countertops and contrasts the matte gray cabinetry. See more photos of this kitchen, here. Designed by MOOARC. 13. 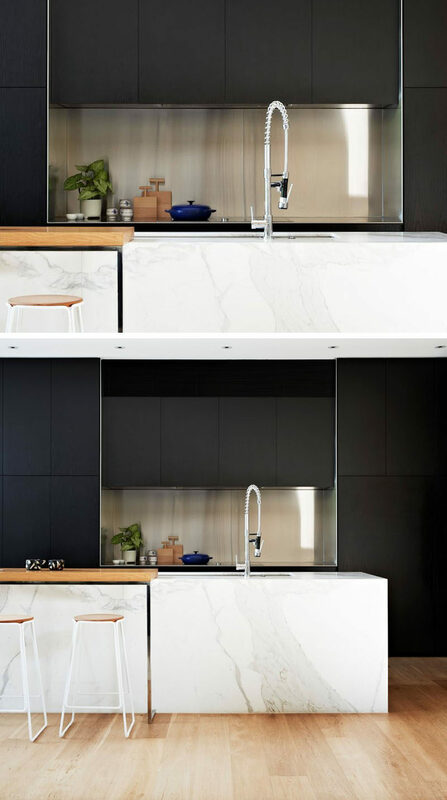 Surrounded by black cabinets, the stainless steel backsplash in this kitchen creates a contemporary look and makes it easier to clean up when you’re done cooking. See more photos of this house, here. Designed by AGUSHI and David Watson Architect. Interior design by Workroom Design. Photography by Armelle Habib. 14. The stainless steel backsplash in this kitchen matches the appliances and the island and helps to brighten up the space. See more photos of this house, here. Designed by Grouparchitect. Photography by Chad Savaikie. 15. 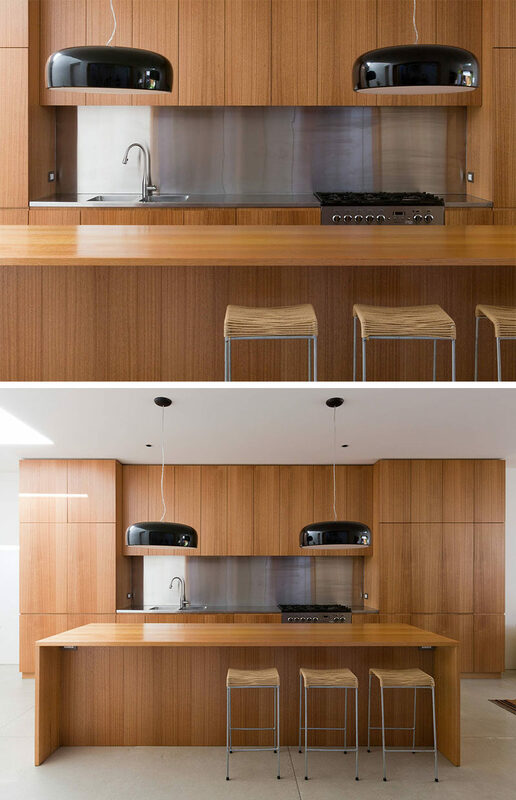 Stainless steel wraps around the cut out spaces in this kitchen to make for easy clean up and to help modernize the wood interior. See more photos of this home, here. Designed by Dorrington Atcheson Architects. Built by Straight Line Building and Henry Dunham Building. Photography by Emma-Jane Hetherington. 16. 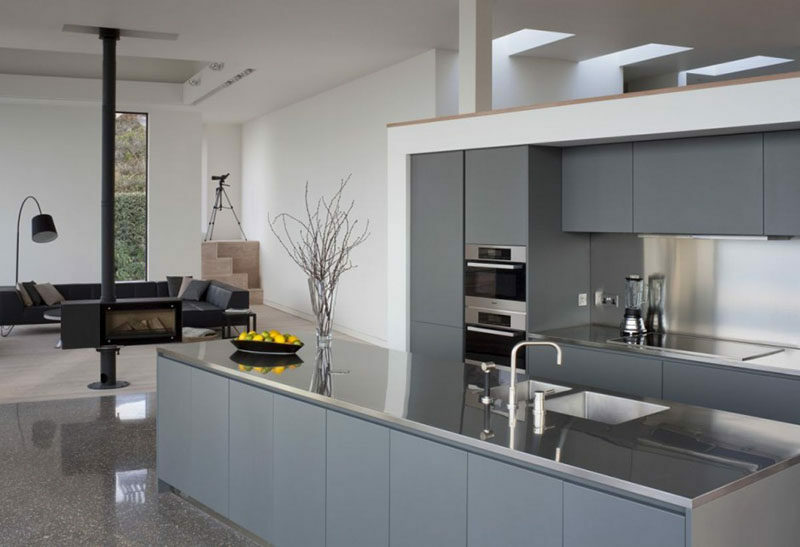 The combination of the stainless steel backsplash and the concrete island make for a durable, contemporary kitchen. See more photos of this home, here. Designed by Andy Martin Architects. 17. 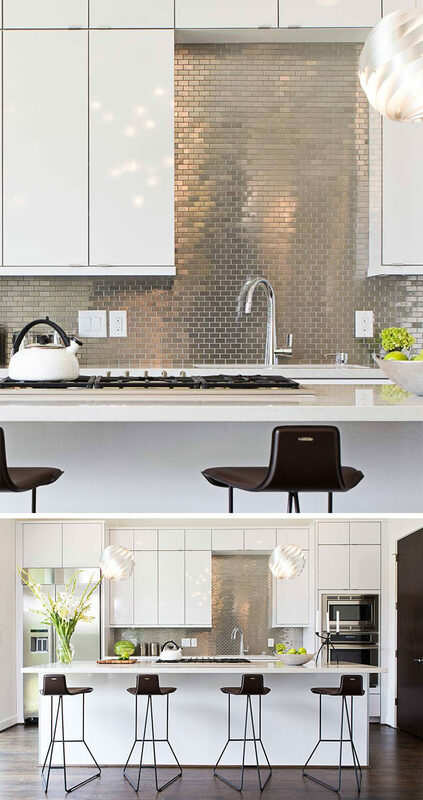 The brick-like arrangement of these stainless steel tiles adds texture and brightness to this tiny kitchen. See more photos of this home, here. Designed by Victoria Benatar. Photography by Marco Ricca.